I'm having the same issue. It appears that about a month ago my phone stopped working. (I do not have a fax machine though) I have the panoramic WiFi router. I no longer have a dial tone. When I plug the phone directly into Tel 1 on the router, there is a dial tone. When I plug the line back into Tel 1 and plug my phone back into the wall jack I get nothing. I called Cox and the dude sent some type of reset code to the router but it didn't work. I've unplugged the router and plugged it back in many times. Still nothing. Why is this not working all of a sudden? When I plug the line back into Tel 1 and plug my phone back into the wall jack I get nothing. Could you explain this a bit more? Are you plugging the phone into the same wall phone jack as you are using for the line from Tel 1? 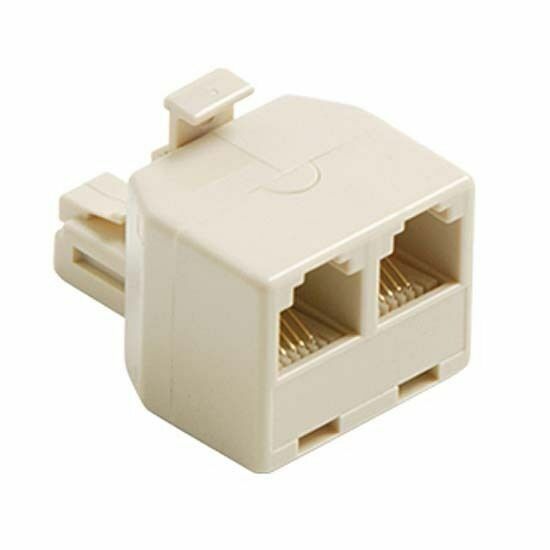 If so, I assume you are using a phone line splitter like the picture below? If so, plug the splitter into Tel1 on the modem, and connect your phone to one jack and the line to the wall jack into the other. Basically you're reversing how you split the phone signal, by doing it at the modem instead of the wall jack. No. I unplug my phone from the wall jack. I then unplug the line in from Tel 1 and plug my phone line directly into the modem, Tel 1, and I get a dial tone. All this is really a moot point because my phone used to work just fine and now, without changing anything, it just stopped working. I'm sure it's just Cox's way of making me pay for yet another service upgrade. I hope I don't need 911 anytime soon. I'm sure it's just Cox's way of making me pay for yet another service upgrade. Umm, no, I doubt it. I think it's some phone wiring issue inside your house. How many jacks do you have in your house? Have you tried disconnecting the other phones? If it works from Tel 1, Cox is delivering the phone service and isn't a Cox issue. I can try to help troubleshoot it, but if you don't want to, then call for a technician. I assume you wanted to troubleshoot since you posted here. Good luck. The house is 2 years old. I only have one jack. Then can you understand my confusion? If you only have 1 phone jack in the house, and you said your phone was plugged into it, how could you have Tel 1 plugged into it too? Also, if you only have 1 phone jack and it's in the same room as the modem, what is the point of using the jack? What do you lose by connecting the phone direct to the modem?